This phone charging pad can charge your phone wirelessly, no need any cable to connect it with the phone when charging, very convenient. It will bring a beautiful breathing lighting effect during charging process, which looks cool but very comfortable. Creates an easy way to charge your phone and it can quickly, reliably and safely to charge your phone. Exquisite shape and portable design, easy to carry. ​Compatible with QI standard smartphones, such as, works for Samsung Galaxy S6/S7/S6 Edge/S7 Edge, or for Google Nexus 4/5/6/7, etc. Don't miss it! It will bring you an incredible experience to charge your phone! Adopts QI wireless charging technology: Just put the QI standard smartphone on the wireless charging pad(the wireless charging pad needs connect with the data cable to get power supply), then it will start to charge the phone, very easy to use. Wireless charging mode: It can directly charge the phone and no need any cable to connect it with the phone when charging. Simple, safe and reliable charging: Only need to do one step and you can charge the phone in no time, safe and reliable. Rapid charging: Swift and fast charging process controlled by smart chip, and it will protect the phone's battery from over-charged. This wireless charging base can charge your devices in high efficient. Safety guarantee: input over-voltage protection, output over-voltage protection, over-heat protection, short-circuit protection and heat dissipation to ensure safety for your phone. It will bring a beautiful breathing lighting effect during charging process, which looks cool but very comfortable, and the soft breathing light won't cause any interference to you even at night. Small size and ultra-thin, lightweight and portable, and you can carry it to anywhere to charge your phone anytime. Achieves wireless charging and avoids the problem of cable winded between the charging pad and the smartphone. 1. Only the Qi standard phones can use the wireless charging base to charge, please make sure your phone supports Qi wireless charging technology if you use the charging pad. 2. When charging the phone, please use adapter(not included) to connect the data cable to supply power to the charging base. I love this thing! I leave it at work and just set my phone on it to charge. It is so nice to be able to just sit the phone down and not plug it in to charge. I love these. I bought two so me and my wife would each have one. My friend has one. I used it once. Needed one. Wow! This is a great little charger. It’s so thin, it looks like a coaster. It charges perfectly thru my case and is very easy to use. This is an awesome gadget. It was reasonably priced and works exactly as described. I am amazed at how this works, charges up the phone almost as fast as plugging the cord in it. 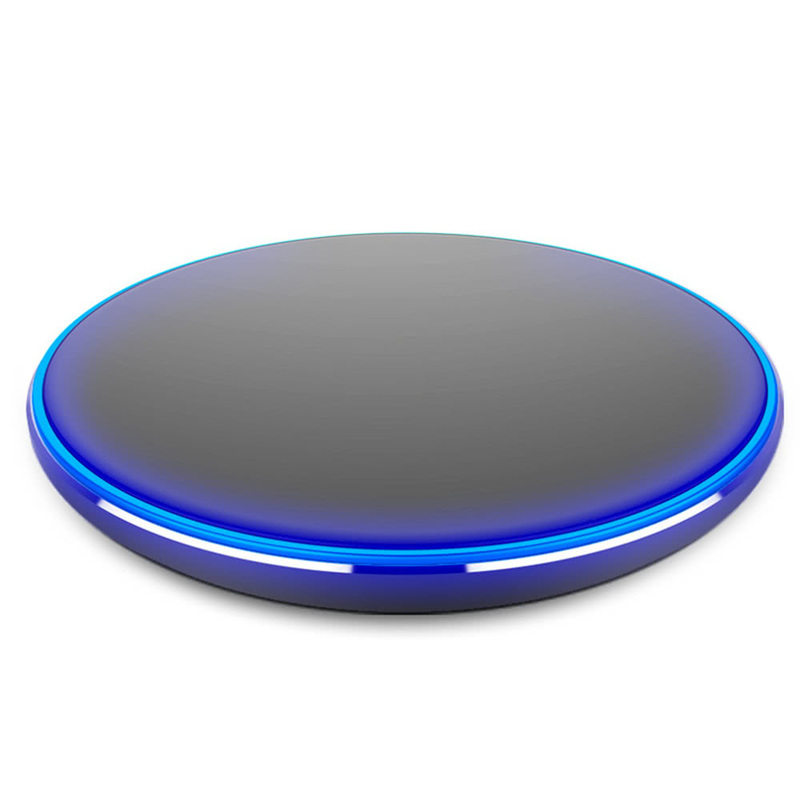 I really like this wireless charging pad. The only reason I wouldn't give it a 5-star review is because it's sometimes difficult to get it to connect. The phone has to be sitting at a precise spot on the charger for it to connect. Just received this charger and I love it. Awesome charger! well worth it! Easy to use, responsive, good!